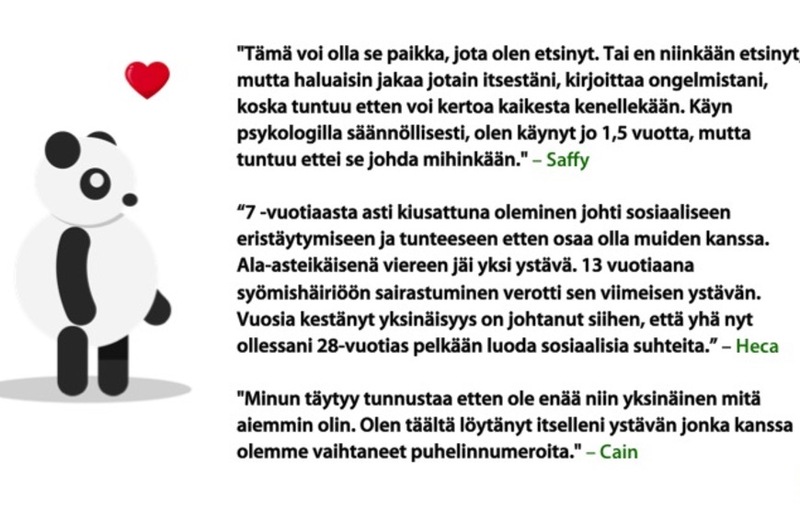 We have built the largest social media services in Nordics - Suomi24 and IRC-Galleria. Now we focus on fixing the biggest wellbeing challenge and changing the way people receive help related to mental health issues. Help us to build the peer support online community, where every voice will be heard. Even though one third of the world’s population has mental health issues, most of them are too afraid to seek help or do not get help. Shame and fear of stigma are overwhelming obstacles. The health care system is powerless in the face of this problem. Everyone knows someone who has mental problems or is actually experienced challenges in their lives. The worst thing is to be left alone feeling bad. We have all the tools to make the change happen. Supported by the technology, people who are in need of help can find the helpers easier and safer than ever. We in Heimo believe that you can solve this huge problem only by helping people to help others. The community has the power to help more people. No one needs to be alone. 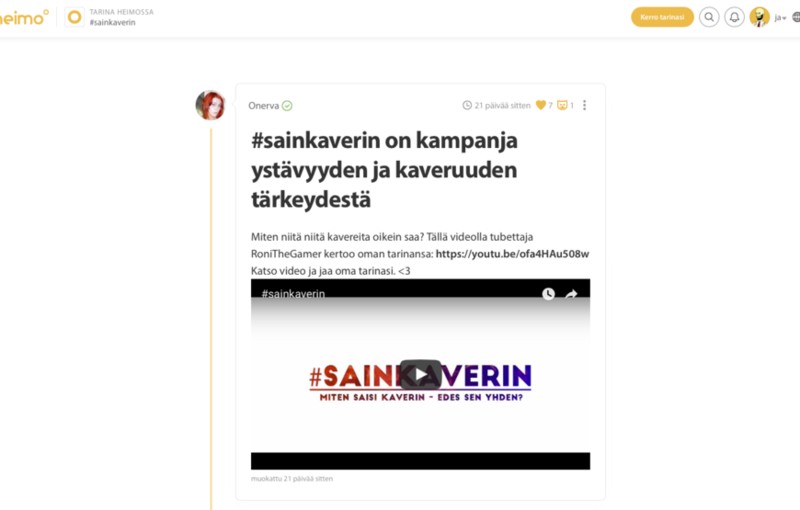 Heimo is an online community where peers help each other. Anyone can find someone who has gone through the same challenges in their life. The best helper is the one who has solved the same problems. Nothing is more meaningful than compassion and empathy. 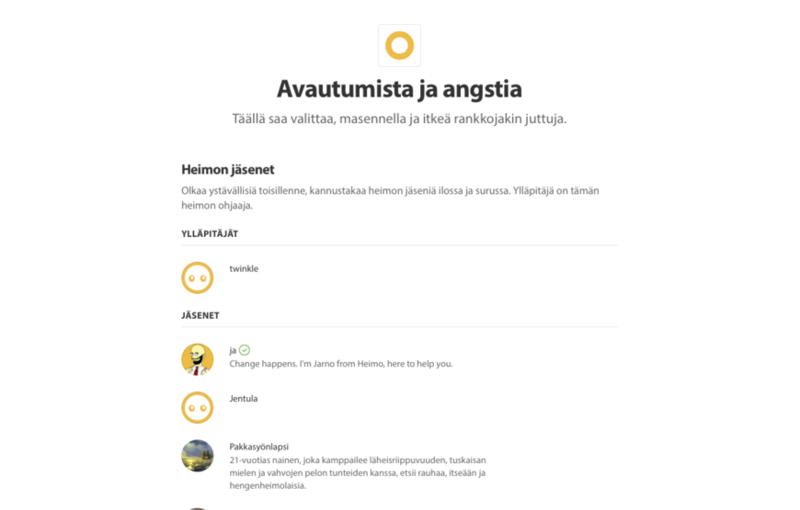 In Heimo anyone can find their own tribes (discussion groups) or create their new ones. The administrator is not limiting topics people can talk about. And people can influence the creation of tribes and become maintainers of a tribe. Heimo is anonymous and easy to use. It’s the community where people can meet one to one or in larger groups – in peace and without a fear of shame. Discussions are public or private. For example, private tribes can berun by professional helper with the therapy group. Now we need your help. You have an opportunity to own a piece of Heimo and become a part of the best peer support online community in the world. Join us and help people to help others. 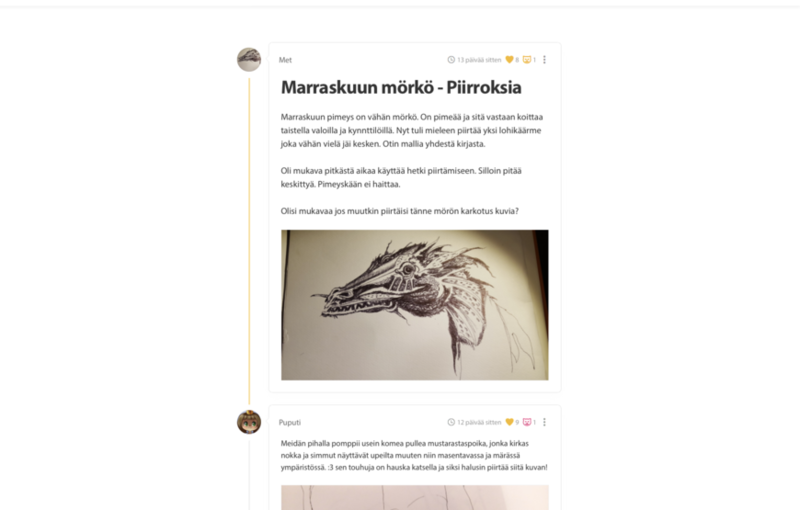 Heimo was launched in Finland on May 5, 2014 and there has been over 35000 unique visitors, over 320 tribes are created and 7500 stories told. People have received invaluable help and found friends for life. We got funding from Tekes, as well as from the private investors. Our mission is to help as many people in the world as possible, and to become the biggest peer support community. 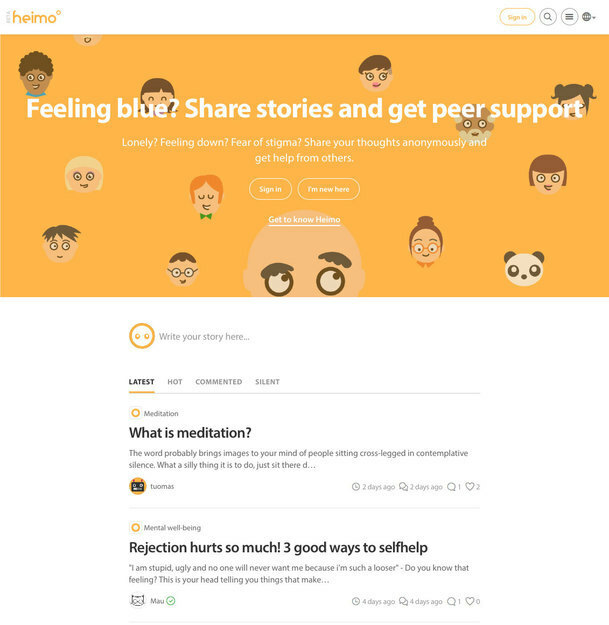 Heimo is disrupting the way people get help and change the mental health services forever. Our community enables more people than ever to get the help they need. One third of the global population has suffered some kind of mental health issue during their lifetime, however 66% of them didn’t get help. In Finland in 2014, 40% of a disability pension recipients had a disability due to a mental disorder. A year earlier, 2800 young people took disability pension because of the mental problems. Mental health problems are increasing year by year. The current health care system focuses on treating the sickness. People are not getting help early enough and it’s hard to get assistance - even if people would be able to help each other at an early stage. It is clear that the current health care system is powerless to tackle this challenge. In building online community it is all about getting critical amount of users. 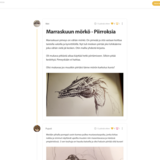 Heimo is a free community, where users can write and read stories, and create their own tribes. There are three main revenue streams. There are people who need help and those who are able and willing to help in Heimo. 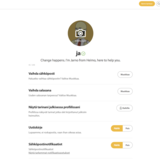 If person in need of help wants to talk privately and find the helper right away, Heimo connects them through online session. Helper can define the session rate and this revenue will be distributed between Heimo and the helpers. We offer specific branded discussion topic pages for associations and organisations. These organizations include various non-governmental organizations, peer associations and insurance companies. Native marketing is a type of online advertising that matches the form and function of the community. Native advertising does not interfere with visits, but blends well into the community. Native ads can be used, for example, by professional helpers to provide their own services for people seeking a professional advice. Also, companies want to sponsor specific themes and tribes. Native advertising is one of the fastest-growing forms of advertising and familiar to users in the major social media services. Why to invest in us and how we are different from others? First of all, we build the best social media to find and share meaningful stories. We have shown that we can build large communities. Secondly, we are building a community for mental well-being. 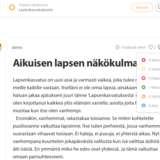 Heimo’s founders have created profitable social media businesses with a total annual turnover of several millions of euros. Timing, methods and place are right. More and more people/companies around the world draw attention to preventive measures, but still there are only few solutions. People are used to getting services through the internet right here and now. There are several different discussion forums, but most of them are developed in the 90’s. Associations and organizations need a new kind of a solution, which works with different operating systems (mobile, desktop). But they would need money to develop it. You can get an access to Heimo in one minute. There is no similar social media service or a peer support group operating in the same field. 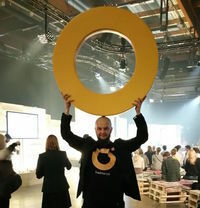 Heimo’s founders and developers themselves have invested money to the community They are highly motivated to make Heimo the world's largest and best peer community. We acquire users via influencer marketing, media co-operations and connections with professional mental health organizations and associations. We have already tested these methods and seen that these are the best way make Heimo to an international community. As for “internet influencer” method, it means that we partner up with celebrities that have millions of followers in social media. 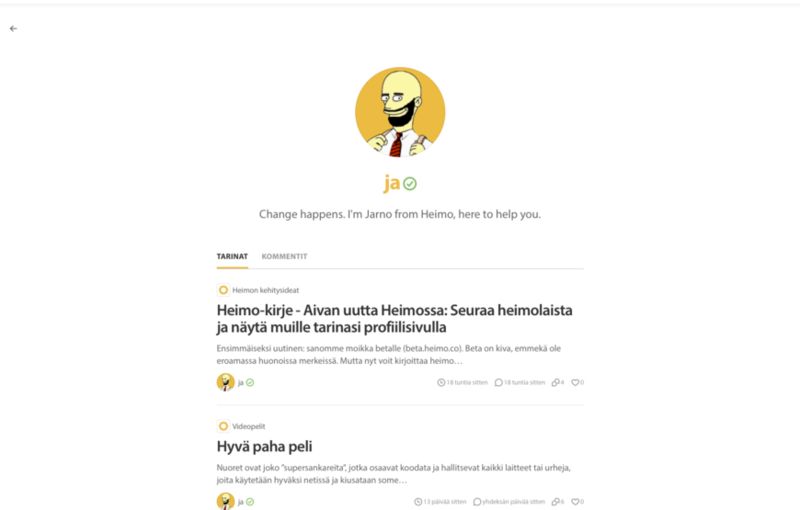 They get a share of Heimo (become co-owners), and in turn they promote Heimo to their followers. We have already done that with a local social media influencer in Finland. He attracts over 1,5 million users on a weekly basis. 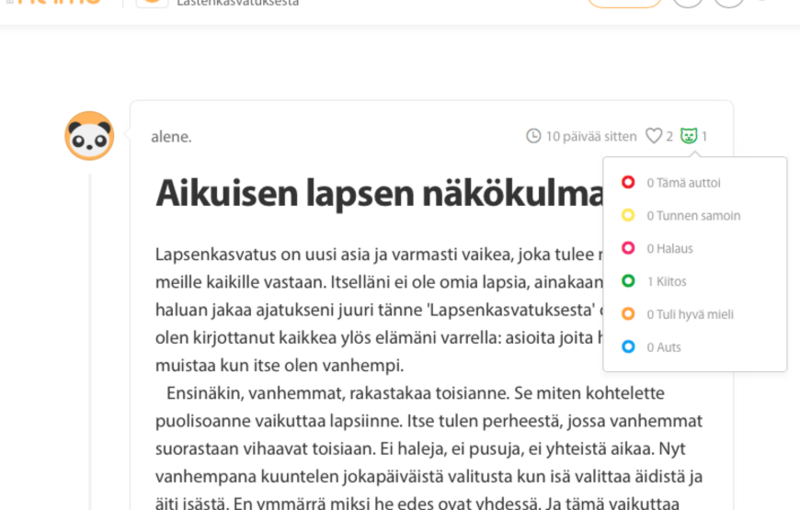 One post on his Facebook page can drive thousands of users to Heimo. 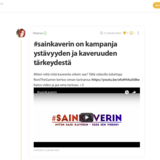 The CEO of Heimo Jarno has successful experience of applying influencer marketing strategy in practice, and he has even written a book about this topic called “Social media stories from Finland”. 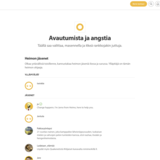 Several association and organization are already using Heimo. 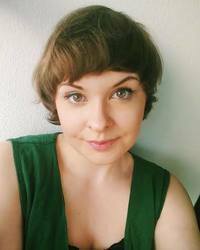 Among them, for example, are Student Healthcare Organization and the City of Helsinki (capital of Finland). 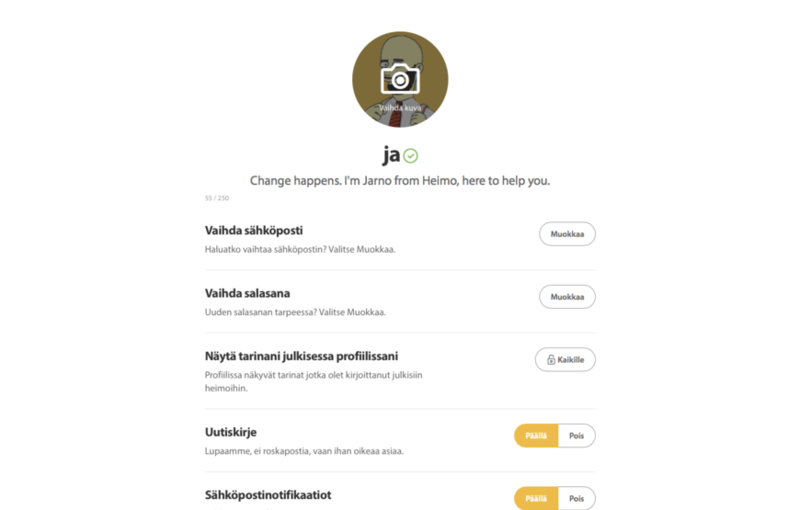 Also, one of the biggest peer support providers in California is now using Heimo.We also plan to further cooperate with international NGO’s and associations to increase Heimo’s user base. “I was bullied from the age of seven and it lead to a social isolation and the feeling that I don’t know how to be with others. In the primary school I got one friend. Our team has over 40 years experience building social media services. 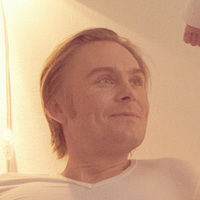 Two of our founders have created the largest social media services in Nordics - Suomi24 and IRC-Galleria. We also have psychologists as co-founders and we use this asset to create a new kind of a social media platform. Our developers and empathy architects are specialised in building user centric services on different platforms. We also participate in the Vertical accelerator program, to which more than 140 companies from 23 different countries applied, but only 11 wellness and health technology companies were selected. With the help of you and the active users, we will build the best peer support online community in the world – the social media, where everyone can share their sensitive issues and meet people, who are listening and helping. Together we are more. 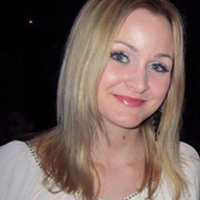 I have over 15 years of experience in creating social media services and I have been leading the largest social media service in Finland called Suomi24. Social media is a great place to build your own identity, but the downside of an online presence is that it can also break down your own self-image. That's why I want to participate in building the online community that encourages others. I have experienced many losses during the past two years, but it is really difficult to talk about itm. After all men don’t cry or are not supposed to share their feelings?! In a way, I am building Heimo for myself, so that there would be a place where I can safely find support from others and to be myself. It doesn’t matter if you are alone in a small village or lonely in a big city - in Heimo you don’t have to feel lonely. 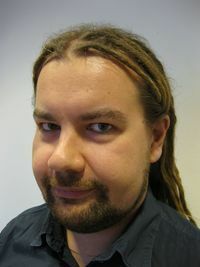 Co-Founder of IRC-Galleria and awarded as the best Finnish programmer (2015). In Heimo I oversee technology and product development. I am doing Heimo because I have also been in therapy for three years. During this time I realized that many people are suffering from same issues and how broken the world is. I also realized that it takes a long time to talk to someone. For example, for me it took 8 years. I know that listening does need a trained psychologist, but the same results can be achieved with easy instructions. The most important thing is that every person finds another human being to trust and start their own mental healing process. I feel that here in Finland there are couple of national traumas. The scars from the Second World War and empathical coldness has lived through generations and we are the first generation that sees these traumas living within us. Also, the 90s recession has broken the minds of the children of that era and they are fighting it every day without knowing what is wrong. There is a huge risk that these traumas will be passed onto the next generation and this needs to be stopped NOW! I believe that other nations have these traumas too and with Heimo we can help them to help each other! 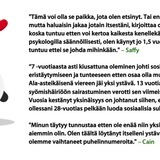 I conceived these ideas before Heimo was started and decided to join Heimo because I believe that we all should join forces as we have a common goal to healthe humanity from mental issues! I believe that the humanity as a whole can be seen as a system. The parts of this system should take care of the whole system. I believe that with technology we can make the world a better place by connecting people. This is the key thing what we are making with Heimo. Now I invite everybody to work on this matter with us to fix the world from biases on the human mind! When the people are healed they are more efficient for themselves and for the whole humanity. This takes the whole world a huge step forward! 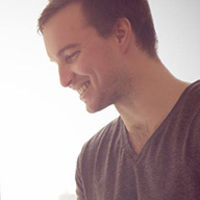 I’m one of the co-founders of Heimo and a psychologist. Previously, I was working as an international business consultant and helped people and companies to succeed every day. As a psychologist, in my opinion it’s important to give suitable tools for peer support, developed by psychologists for the people, to be able to tackle one of the biggest challenges in the world - mental health problems. Peer support is used in treatment or recovering of every disease or disorder and we need to give the best possible tools to help each other. Sharing economy and digitalization has come fast to taxi and accommodation industries and now it starts to support consumer healthcare industry. In Heimo, we are building a global community, where people in need meet helpers. Our mission is bold, but realistic, and our opinion is that there is no reason to just wait until governments or others will solve this problem. Despite that, we have to start working together now. Despite of being a licensed psychologist, I have spent all my working life in business development in various roles from sales to consultancy services. One of my best friends committed suicide and I felt helpless when it happened. I couldn’t help him. The healthcare system didn’t help him although he sought for help. That experience made me start thinking about different ways to provide help for all, not just the privileged. I think Heimo really prevents life crisis from escalating into severe mental health conditions. I believe also in the power of masses and crowdsourcing. 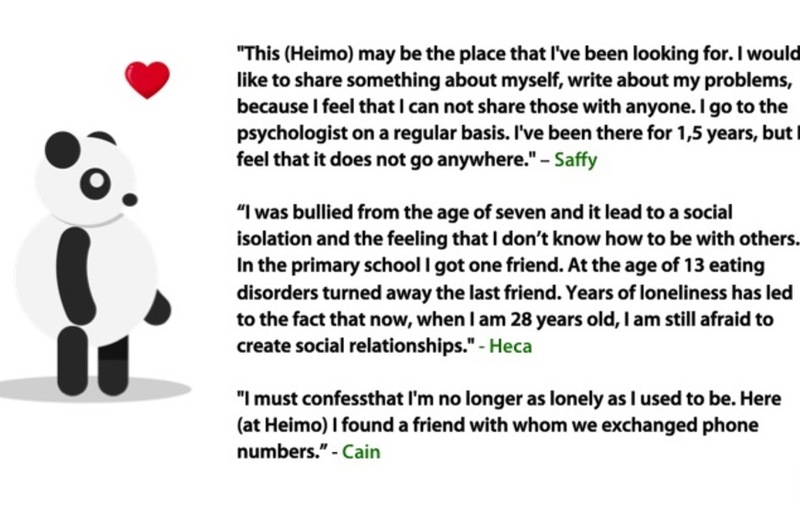 Heimo enables those who have recovered and survived from any life crisis to support and help others. This is my way to pay back to my friend whom I couldn’t help. He’s gone now but there are others that need help. Heimo is made for them. My passion is to design meaningful services for people, and I want to make this world a better place. In Heimo, both of my passions come to true. Loneliness is the disease of our time, but communities have the power to give meaningfulness. People make our life worth living and peer support gives the support for the problems we witness. 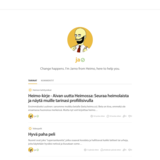 I'm happy I can listen to people in Heimo, and with that knowledge, I can design the best service for helping people. 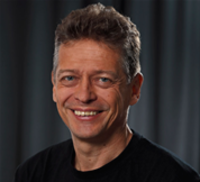 I’ve worked as a psychologist with children, youngsters and young adults. In this job, I’ve often felt helpless for not solving all problems related to loneliness and not being able to shape my client’s social environment. I understood that even if we, mental health professionals, are needed, people in the person’s everyday life play crucial part in the process of healing. Also, the queue to the reception is always too long. Particularly amongst the youngsters, the psychologist appointment is rarely scheduled precisely to the very moment, when the client’s going through the most distressing times. 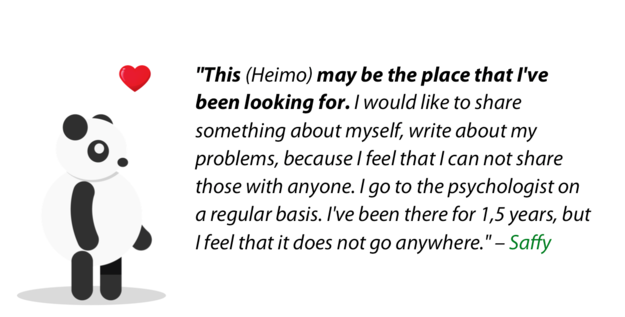 For these reasons Heimo’s peer support community offers a lot of possibilities to prevent mental health problems. At Heimo platform, anyone can reach out for help at the time they need it the most. 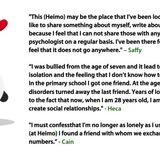 Heimo peer support community can also work as a group, and being a part of one can bring meaningful experiences to people’s lives. Also, you don’t have to queue to get to Heimo. Heimo is for everyone, who needs help or who wants to help others. I want to be involved in supporting and helping people, as I strongly believe in success of ideas that have the potential to improve everyone’s lives. A globalizing world will create countless new opportunities for cooperation between people, but at the same time, it opens the door to even greater loneliness and the feeling of smallness. Heimo creates a bridge between the lonely ones, giving the opportunity to meaningful engagement. Social responsibility and caring for others are very meaningful to me. At the moment, however, they are outsourced to the society, even though each one of us has a lot to contribute to others in need. Heimo makes it possible to meet individuals who help others. This makes possible a formation of communities in a new way, without a need to meet a certain threshold in order to get in.